Jeonju City is surrounded by seven peaks of the Noryeong ranges, including Girinbong Peak, Mt. Godeok, Mt. Namgo, Mt. Moak, and Wansan. It is built close to the Jeonju River, downtown Jeonju is overal flat. There are gentle slopes towards the North. Jeonju is a provincial capital and the largest city in Jeollabuk-do. It is a nice city which is surrounded by mountains and farmland. The city is growing fast, almost 700,000 residents are living within it's borders. It is famous for the local version of bibimbap. 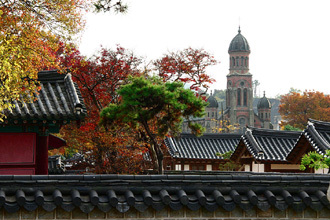 There are several cultural and historical sites in Jeonju. The two most important sites are Gyeonggijeon (historic palace ground), and Pungnammun, which is the only remaining gate of the wall once encircling Jeonju.